Born and raised in suburban Sydney, Cuthbert “worked in her father’s plant nursery as a teenager while training in her spare time,” said The New York Times. 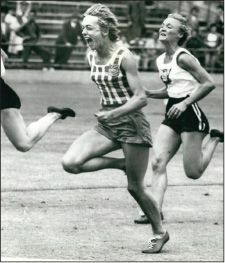 Convinced she wouldn’t make it onto Australia’s team for the 1956 Games, she “purchased tickets as a spectator when the Olympics neared.” But Cuthbert was the stand-out star of Melbourne, becoming the first Australian to win three Olympic golds. Cuthbert “failed to defend the titles at the 1960 Games in Rome owing to injury,” said The Guardian (U.K.). She took a two-year break from sprinting and considered quitting the sport. But Cuthbert changed her mind in 1962 after hearing what she thought was the voice of God urging her to run again. “The voice came back again and again,” she said. “Finally, I said, ‘OK, you win. I’ll run again.’ As soon as I said that, this wonderful feeling came right through my body, and I was mentally keen to want to do something again.” Cuthbert took gold in the 400 meters at the 1964 Tokyo Olympics, becoming the first athlete in the world to win four different Olympic events.